Interests - Playing football, being outdoors, going to the park, watching dvds and his favourite programs Mickey Mouse Club House and Timmy time. He loves music, singing and dancing, playing with his toys and reading books, things to do with space and Super Mario. Kaden was diagnosed with Cystic Fibrosis at 4 weeks old. It was confirmed that Kaden had Cystic Fibrosis through the heel prick test and a sweat test. They started treating him immediately with the medication he needed to keep him well and also with physiotherapy. Kaden has grown many bacteria’s on his lungs for the last two years including pseudomonas twice, so he has to have a nebuliser twice a day to keep it at bay. Kaden also has poor weight gain and is on a high fat diet but does not eat a lot. He is small for his age and we have to put powder in his milk to add extra calories. 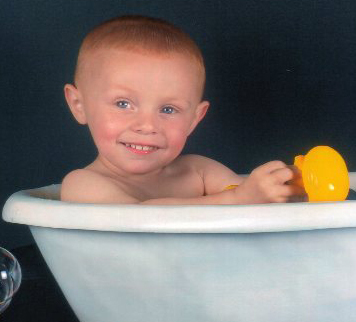 Kaden does not go to nursery or play groups due to infections and is an only child so he is very lonely. Well, first of all an apology for not updating in a while, we have been so busy moving and decorating our new house and we finally have the internet back! Kaden’s got a new great big bedroom which he loves; in fact we don’t see him much these days as he’s up there a lot! He had a great Christmas and got a new toy kitchen to play with and a million other things! He loved the snow we had. He’s also enjoying school so much, he has lots of friends and sings in class all the time and gets gold stars for his singing. His puppy slinky is now six months old and is doing great. He and Kade are best friends. He is doing great health wise as he’s eating really well and has weight on him! We had a few ups and downs with coughs and colds, but nothing serious. Thank you to Sharon (Courtenay’s mum) for the wonderful memory box. We have also had lots of post and gifts from people, so thank you all. Well a lot has happened this month. Kaden celebrated his 3rd birthday and had a space party, it was great fun and he really loved, I think it was his birthday for about a week! He also started nursery which I was more worried about than him, but he loves it so much and loves going everyday and has made lots of new friends. Also, a big surprise for him was that he got a new puppy called slinky rex buzz! They are already best friends! He is a Jack Russell and so cute! Kaden received lots of cards this month for his birthday some wonderful gifts. Lots and lots of thank you’s to everybody who took the time to send him a gift and spend their well earned money! We’re so thankful. I’m so sorry that there is too many gifts and names to mention, but we do have a list of thank you’s that we will get round to doing to each and every one of you. Kaden’s been a little ill this month. He has a chest infection and he’s on meds so hopefully he will be ok soon. Our dog also sadly died and he was really upset over that, but every day gets better. On the bright side, Kaden got a new space bedroom and he loves it – a big boy room! We have also been to butlins and had a really fun time. There was lots to do and Kaden really loved the beach, it is his favourite place. He’s also looking forward to his birthday coming up (a big three!) and he’s having a space party. A huge thank you to Grace for writing and sending Kaden lots of drawings and a little friendship bracelet, we really look forward to getting post from you. Also, thank you to Sheelagh Hawkins for sending Kaden a doorbell for his bedroom, such a great thing, he has recorded a message for his new bedroom and he shouts ‘get out of Kaden’s space room’! He loves it. Thank you to everybody else who has sent post too. Well, what can I say; Kaden did come off his neb and seems to be doing great. He has grown so much which is fab and he’s also starting school nursery this term. He wasn’t going to go but because he’s doing so well it is such a shame to miss it and his CF nurse said he should as it will do him wonders. Of course Kaden is so happy he gets to go and play with all the kids and have friends, so all is very good at the moment, he is amazing. Thank you to Grace Bridgewater for the fab picture you drew of Kaden – it was so good, you have such a talent and he was made up with it. Thank you to Penny who got Kaden a drawing and painting set and me some chocolates which were lovely, you are so kind. Also, thank you to Miss Trevor for the toy hamster, and to E Mason for the danger mouse teddy. You are all so kind. We haven’t got round to thank you cards just yet, but we will. There’s not much to update this month. Kaden has just had his review and he’s doing really well and fingers crossed he might be coming off his nebuliser soon if his cough swab is clear. He hasn’t grown pseudomonas for a while so here’s hoping it is gone for good. He has been eating a lot better and put on a few pounds which is so great after along battle. He has got a chest infection at the moment but he is still running round like a loony! Thank you for the lovely cards and gifts. Kaden loved the box of pirate stuff, thank you very much. He also loved the music parcel too. Sorry if I didn’t mention everyone, it is hard to keep up with so many lovely gifts and cards, he really is a very lucky little boy. Kaden has had a great month and we have been very busy had lots of parties to go to. Mummy has also passed her driving test so there is no stopping us. My Auntie Kerry is doing a skydive on the 22nd of May for Cystic Fibrosis so we will be watching and cheering her on! We are hoping to raise lots of money. I got a new Bob the Builder bike this month and I’m learning to ride it. I also had a little accident as I fell down the stairs, but I’m ok now. I promised mummy I will never go on the stairs on my own again! Well, got to go, me and mummy are going to bake some buzz cakes. Thanks for the post this month and the lovely Mickey Mouse drawing – Kaden loved it. Kaden has had some great gifts this month too so thank you very much. Kaden has been unwell for a few weeks with bugs, has grown a few bacteria and has also got a nasty cough. As always though, he carries on being a nutter! Nothing puts him down. He really enjoyed going to see Snow White and sang all the way through. We went to the fair yesterday and he just loved it. The weather was so sunny, which we love, as we get to go out and have fun in the sunshine! Easter has been great and Kaden has lots of chocolate! Thank you to everyone who sent him an Easter present. Thank you cards will be sent to everybody soon. Kaden received some lovely gifts, so a big thank you to Lokryn and Talek, also to Alan and Julie, and Emma Irvine. Thank you to everyone else who sent Kaden post, there are too many to mention. Also, a big thank you to Yvonne who sent me a lovely box of gifts for Mothers’ Day. Post Pals is doing a wonderful job and making so many children happy. There’s not much to report this month, other than Kaden is doing really well at the moment. He’s put some weight on and we are also really looking forward to summer this year so we can get out more. He’s really looking forward to going to see Mickey Mouse and Snow White in the Echo Arena. We’re so excited as they are his two favourite films. He is really enjoying getting his post; he’s such a happy little boy. Kaden received a Timmy Time bedroom door sticker with his name on which he loved so much. Thanks to everyone. Kaden has had a great month; he is really well and is even eating! He’s put two pounds on – yippee! He loves getting his mail and says he now has lots of friends. Kaden has received some beautiful hand made cards this month and it means a lot that people have put all their time and effort into making them – we like them a lot! Thank you to everybody who sent Kaden mail and gifts. He really loved the Mickey Mouse teddy/pillow most of all – thank you to Charlotte and James for that as it really made his day. Thank you for the books too, he’s received iggle piggle and an animal farm touch and feel book. He loves them. Thank you everyone. The beginning of December was hard for Kaden as he was ill and feeling a bit sorry for himself, which is so unlike him, but come Christmas time he soon was back to his normal self and so looking forward to Christmas. Christmas was great this year and Kaden was really pleased with all his toys from Santa. For New Year we went to a family party and Kaden was the centre of attention, singing and dancing and keeping everyone entertained, which he loves to do. Then of course when the snow came, it made Christmas even more special for him and we loved making snowmen. Thanks for all the cards and reindeer letters as Kaden loved them. Thank you to Alan and Julie for the lovely gifts they sent which Kaden loved, it was so kind. Kaden had his annual review today at the hospital and he has done great on all his tests – we are so pleased, and he has made us all proud today by eating! Let’s hope he keeps it up. Thank you to everybody who took the time to write to Kaden and send him gifts. I didn’t realise how much people care and think about others – you all are truly great. Thank you Post Pals for coming into our lives and making my little boy so happy. Kaden has just received his first piece of mail from Post Pals and I just have to say that I’ve never seen him so happy – he’s over the moon and he is jumping with joy shouting thank you! I would just like to thank Post Pals and the little boy aged 4 who sent him mail, you have made him a very happy boy. We would love to send a thank you card to the little boy but have no return address.